This Company Painting is from a set of five showing details of inlaid marble decoration, or pietra dura work, from the Diwan-i Am (Hall of Public Audience) in the Red Fort at Delhi. The paintings date from about 1845 and are significant because much of the original pietra dura work has now been damaged or destroyed. 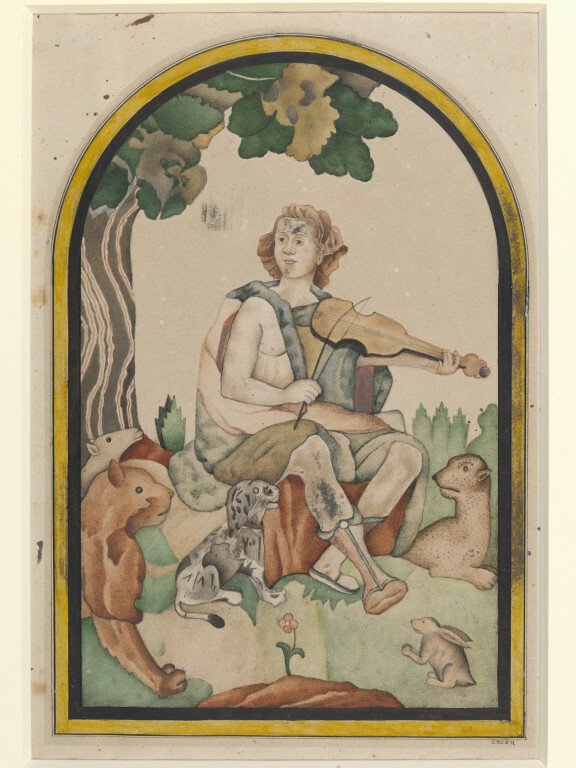 This painting depicts Orpheus, the son of King Oeagrus and Calliope in Greek mythology, who received a lyre from Apollo and was taught to play by the Muses. His music was so beautiful that beasts, trees and rocks were inspired to follow him. 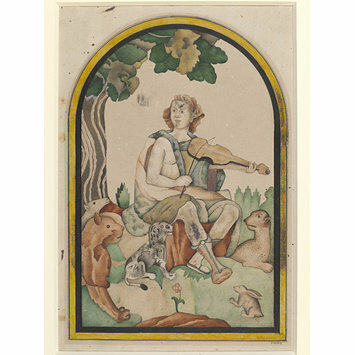 In this depiction of Orpheus his lyre is replaced anachronistically by a violin, which he is playing with a convex bow. 'Company paintings' were produced by Indian artists for Europeans living and working in the Indian subcontinent, especially British employees of the East India Company. They represent a fusion of traditional Indian artistic styles with conventions and technical features borrowed from western art. Some Company paintings were specially commissioned, while others were virtually mass-produced and could be purchased in bazaars. The Orpheus image is one of a set of five details of pietra dura work from the Diwan-i Am, Delhi Palace and Fort.